President Christopher Holoman and Vice President for Development Fred Landry on Giving Tuesday. SHREVEPORT, LA — Centenary nearly doubled the 2018 goal of $100,000 with over $190,000 raised during the fourth annual Centenary Giving Tuesday on November 27. This impressive total marked the best showing so far for Centenary on Giving Tuesday, a global day of online giving that harnesses the collective power of individuals, communities, and organizations to encourage philanthropy and to celebrate generosity worldwide. 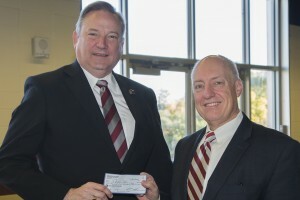 Centenary received a generous $50,000 matching gift as part of the Giving Tuesday effort as well as 181 individual gifts and pledges. Social media and email appeals encouraged Centenary community members to join the online effort and help the College meet its goal. Much of the content for social media was provided by Centenary students.